The biggest advantage of dividend growth investing is the ability to set a goal, and track progress towards that goal. This is because dividend income is more stable than stock prices, which makes it easier to check how I am doing relative to my goals. Stock values on the other hand are much more volatile, which makes reliance on them for retirement planning much more speculative in nature. If noone can forecast stock prices accurately, then how can someone rely on stock prices for their retirement planning? Let’s look at two different scenarios. Imagine, that in the first scenario, the goal is to have $500,000 in 20 years. Based on the 4% rule, you will sell 4% of your assets per year and hope that you will not be retiring at the top of a major bull market ( like the one we had in 1999 - 2000). You save some money every year, and the stock market generally rises. By year 19, your portfolio is worth more than half a million dollars. You decide to wait for another year, in order to beef up your portfolio. Unfortunately, this happens to be the first year of a bear market, where stock prices fall by 30% in the first year, and then 20% in the next one. Are you ready to retire, or not? You seemed ready and above target in year 19, but in year 20 you seem to be behind your goal. You decide to keep on working for an unknown amount of time until the stock market rebounds. In the second scenario, the goal is to generate an annual income of $20,000 in 20 years. You save the same amount of money, reinvest dividends, and could not care less if markets are up or down. You can afford that, because dividends are more stable than capital gains, and go up almost every year. The only time dividends on the S&P 500 fell significantly over the past 90 years was during the Great Depression of 1929- 1932 and during the Great Recession of 2008. 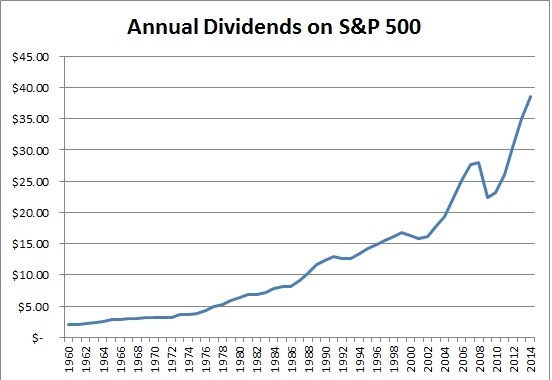 Since 1960, the only significant decrease in annual dividend income was in 2008. That is a success ratio of over 98%. I define significant as any decrease in annual dividend income that is larger than 4%. With the second scenario, you get immediate and actionable feedback the moment you invest the money and receive your first brokerage statement. This statement shows the amount you earned for the period as well as the estimated amount you could earn per year. This lets you check how you are doing relative to your goal. Because historical dividend payments of US blue chip stocks have been stable and growing over time, it is a no brainer for me to base my retirement targets upon the smooth and rising dividend income. By monitoring my dividend income, I know if I am on track or if I need to make a change such as replacing a company that no longer is pulling its weight in my dividend growth symphony. If you plot your dividend income received every quarter or every year, you will have a much smoother ride towards your goal. If you instead plot the value of your portfolio, you will have experienced at least a couple of periods of short-term turbulence along your journey. For example, if my portfolio value hits $450,000 in year 16, I may believe I am on track. However, if the stock market goes down the next year and then drops in the subsequent year for a 30% – 40% plunge, does that mean that I am on track or not? The problem with relying on portfolio values is that they are set by the emotional state of Mr Market, who is irrational at best. The mood of Mr Market could be optimistic in one year, and then deeply pessimistic in another. Dividend payments on the other hand are dependent on the underlying fundamentals of the businesses. Because there is ample margin of safety between earnings and dividend payments, US corporations as a group rarely cut or eliminate dividends during a recession. For example, the first company I analyzed on this site in 2008 was Johnson & Johnson (JNJ). The stock was selling for approximately $62/share, but paying a dividend of 41.50 cents/quarter ($1.66/year). The dividend was increased during the time from 41.50 cents in 2008, to 75 cents/share in 2015. The share price is now at roughly $93/share, though it was much higher in late 2014. If you look at the share price over the past decade, it looks like it went all over the place. It stayed between $60 to $70 up until 2008, then went all the way down below $50 in early 2009, before going back to selling around $60/share until 2012. It wasn't until 2013 that the share price went above $70/share and stayed there. A shareholder who was only fixated at the price likely saw it as going "nowhere" for 6 long years ( assuming of course that they didn't get scared and sold in 2008 or 2009). This goes to show you that capital gains are unpredictable, as you can never know when to expect them. You can have a perfectly good company, which is increasing earnings per share, and the stock price could still go nowhere. Imagine a situation where you have to sell shares in order to pay for your expenses in retirement and there was no dividend. Let's also imagine that the stock market doesn't see the value for six very long years. As a result you are very likely to be selling a lot of shares at low prices to fund your expenses. The stock market can price shares as it wants, and you can either take it or leave it. But if you have to sell shares to live off your nest egg, you are at the mercy of Mr Market, who can value shares anywhere from 5 to 100 times earnings. It is little consolation that shares went up afterwards - you sold a lot of shares low. When you sell low for 6 years in a row, you will likely have sold a quarter of your holdings at rock bottom prices in retirement. This is not a smart way to retain wealth. If you look at the trend in annual dividends however, it is quite a different story. 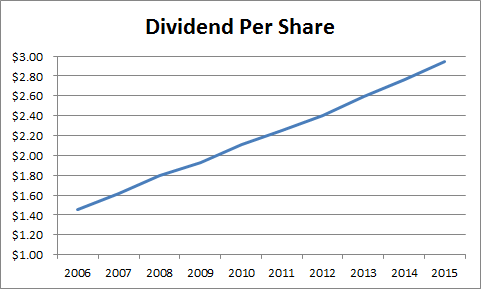 The annual dividend paid increased from $1.46/share in 2006 all the way up to an estimated $2.95/share for 2015. An investor who focused on the underlying fundamentals, rather than speculative stock prices, would have stayed the course. If they were living off their dividends with Johnson & Johnson and other companies in their portfolios, you would not have even noticed that the world had experienced a financial crisis between 2008 and 2009. When you are paid to hold to a stock, you can afford to be more patient, and to hold for the long-term. The cash dividend that is deposited to your brokerage account serves as positive reinforcement, which helps you keep your cool and ignore the volatile prices that are set when Mr Market goes a little crazy. This is the smart way to build wealth, which has been encouraged by everyone, including Warren Buffett. As they say, slow and steady wins the race. As we can see from the data presented above, nobody can tell you whether Johnson & Johnson will sell at $60 or at $120 over the next year. However, I am pretty sure that over the next 12 months Johnson & Johnson will pay at least $3 in annual dividend income for every share one holds. This is why a strategy of living off dividends in retirement is more sustainable than a strategy of selling off chunks of the portfolio to live off. Currently, for each $1,000 that an investor puts in Johnson & Johnson, they can expect to generate over $32 in annual dividend income. If history is any guide, this stream of income will increase at or above the rate of inflation over time. If the investor needs $1,000 in monthly income to live off in retirement, they can see that they are at almost 0.30% for their goal. By saving and investing each month in companies like Johnson & Johnson, the dividend investor will be able to see immediate results when their dividend income keeps rising. They would also be able to easily track their progress towards their goals. If they stick to their plan, they will get one step closer to financial independence with every single investment that they make. And that my friends is a very exciting marathon to run. How far along are you on your journey to financial independence?